It's a Scrappy World: 7-13 New Stella Says Sketch Challenge for Christmas in July with CtB with Bugaboo Stamps! Your card is beautiful, thanks for sharing. Such a cute image and your card is fabulous! Thanks for joining us at the Sisterhood of Snarky Stampers for the B is for Brads or Buttons challenge! Cute Christmas card! Thanks for joining the snarky sisterhood for the "B is for Buttons or Brads" challenge!! Thank you for sharing your card with us at Simply Create Too. Cute! 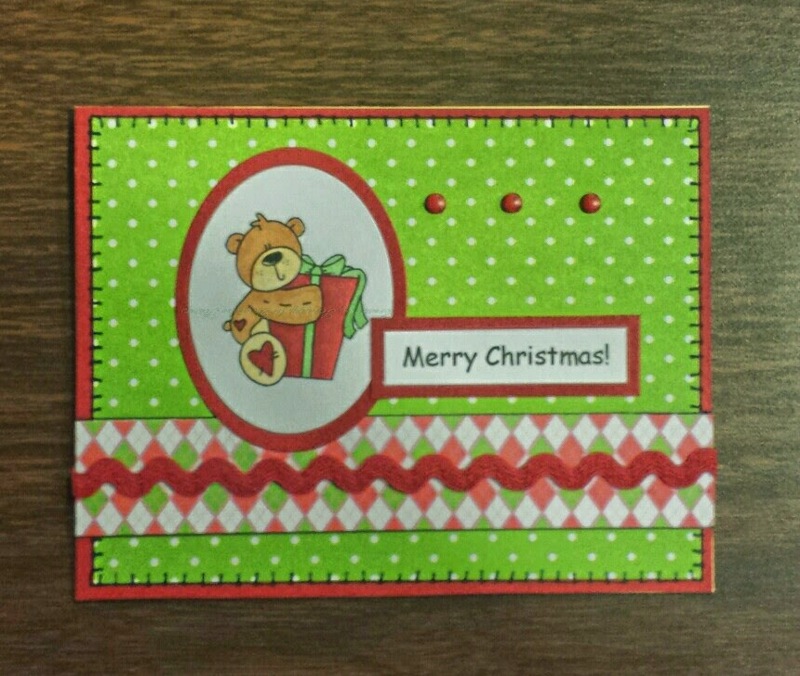 Thank you for entering our "Christmas in July" Challenge at Simply Create Too with your lime green Christmas card. Also looking forward to seeing your entries in our new challenge which starts tomorrow [Friday]. Sweet Christmas card. Love that stitching that goes along with your bear. Thanks for joining the B is for Brads or Buttons challenge at the Sisterhood of Snarky Stampers. What a happy Christmas card with that bright green background. Love the stitching around it. What a fun and cheerful Christmas card! Love the embellishments -- the rickrack, (faux?) stitching, and of course the brads! Thanks for joining the fun at the Sisterhood of Snarky Stampers! Cheerful card. Thanks for joining the B is for Brads or Buttons challenge at the Sisterhood of Snarky Stampers.